Bingo is one of the popular arcade games around the world. Its simple nature makes it a go-to choice of players who want to try something new. There is no strategy required or any special skills needed in playing this game. Over time, the game has evolved in different forms. Game developers have created various ways to engage more players in this kind of game. The main goal of the classic bingo games is to match the number printed on the player's card with the number being drawn and announced by the host or game master. Once the player completed the required arrangement in the card, he or she must shout "Bingo!" The first player to do so will win the pot money at stake. Players of the classic bingo games may opt to play more than one card. This game can be considered as a pure game of chance because the numbers are drawn randomly. The number listed down in the cards are randomly printed as well. The key in winning this game is attentiveness in listening for the called numbers and marking these numbers on the card or cards. As long as a player can efficiently mark his or her cards, the player will do fine during the game. Nowadays, bingo games are not just available in malls or casinos. Players can enjoy this game in their homes while using their desktop, laptop, or mobile devices. 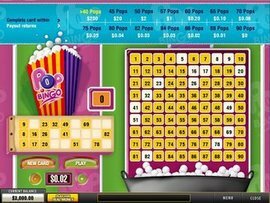 Anyone can easily find free bingo games online. There are some games that can be played instantly using a browser, while others require the players to download a software. Either ways, players can still experience the game. Most online casinos feature popular arcade games for Canadians as an alternative from the usual roulette, slots, blackjack, and poker. Although bingo is an old game, it is making a comeback because of technology and its modernized designs and themes. 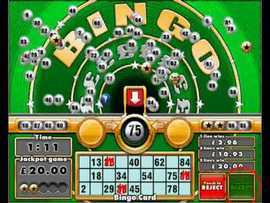 Colorful layouts are incorporated in the bingo cards, which can definitely entertain the players. One common type of bingo arcade games is the electronic bingo game. Players who want to join this game will need a machine where they will mark the numbers being announced or flashed in their screen. These players still compete with each other for the jackpot money. Another way of playing electronic bingo game is by having a reloadable account for individual players. Winnings during the game can then be cashed out using the said account. Bingo Friends is another variant of this game. The game is designed to be fun-looking in a pink background. It is probably created that way to make it more appealing to female players. Aside from being a gaming hub, it serves as a community for bingo players where they can socialize and make some friends. There are also easy bingo games, which can be downloaded straight to the player's mobile devices. Bingo fanatics can start marking their bingo cards anywhere they go since they have their bingo apps in their gadgets. Another famous title is the Pop Bingo. This game is similar to arcade keno also offers bonuses for the players. The best part of this game is that it allows players to select their cards. Despite the randomness in this game, it can be nice to choose your own card to play with during the game. It also has a history function, which shows the previous games and their winnings. Overall, playing classic bingo games can be a great experience. The excitement during the game is something that players may totally enjoy. Regardless whether you play this game in a casino or in a virtual gaming site, you will surely get satisfied with bingo.